Bellbrook (shown here in their black jerseys against Fairborn earlier this season) has a tough home test against undefeated Germantown Valley View on Friday, Sept. 29. 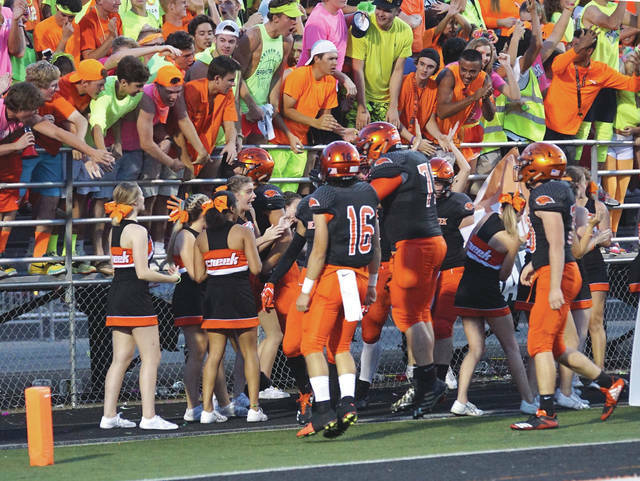 Beavercreek players celebrate with the Beavers student section during the team’s 14-3 win over visiting Kettering Fairmont on Sept. 22. Three Greeneview Rams tackle a Springfield Northeastern ball carrier, during Friday’s Sept. 22 55-7 homecoming win in Jamestown. GREENE COUNTY — As the second half of the Ohio High School football season gets under way on Thursday (with Fairborn’s homecoming against with Riverside Stebbins), three area teams remain firmly in the thick of the chase for a coveted spot in the post season playoffs. Two of those three received state recognition this week. Undefeated Greeneview romped in its homecoming game last week over winless Springfield Northeastern. The Rams are currently ranked 10th among Ohio Division V teams in the latest Associated Press state poll. Among local teams, they’ve probably got the easiest second-half schedule as well. Greeneview’s final five opponents have a combined won-loss record of 6-18, at this point in the season. The Rams’ next three opponents have a combined record of 2-12! While undefeated Beavercreek wasn’t able to crack the AP Division I top-10 rankings, after its 14-3 win over previously unbeaten Kettering Fairmont, the Beavers did receive the 11th most points among D-I schools in the latest poll. The Beavers have a much tougher road to travel in order to make the playoffs. After Friday’s game at (1-4) Springboro, Beavercreek’s final four games will be against teams with winning records. Two of those upcoming games are against state-ranked teams No. 5 Centerville and no. 8 Huber Heights Wayne. ‘Creek’s remaining opponents are a combined 17-8 thus far. But the Golden Eagles host undefeated and Division IV No. 2 Germantown Valley View on Friday. They will then play current No. 10 state-ranked Division III opponent Franklin (4-1 after losing to Valley View) the following week. This is why they play the games. Playoff teams earn their place in the postseason. 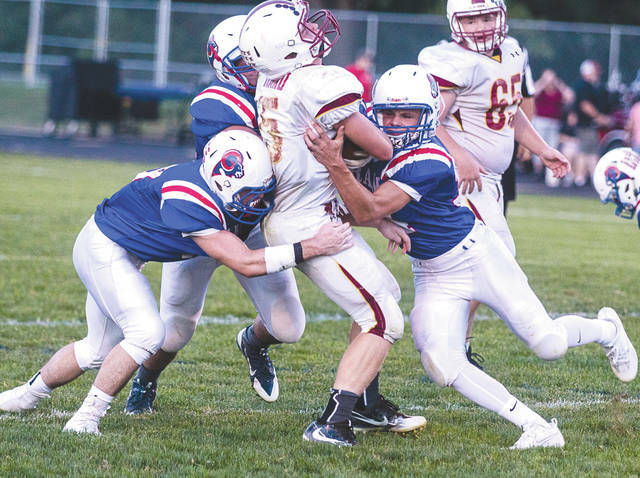 After the big win over rival Mechanicsburg earlier in the season, Greeneview should cruise through the second half of its schedule and return to the postseason. Beavercreek and Bellbrook will have to work for their spots. Beavercreek running game — Led by Kaden Wenger’s 176-yard night, Cody Hocker, Drew Nanda, Sabastian Rendon, Stevie Llanas and Jake Maloney combined for 285 yards on 57 carries, with TD runs by Hocker and Rendon, in the Beavers’ 14-3 win over previously undefeated Kettering Fairmont. Sincere Wells, Running Back, Xenia — Proving that his 285-yard performance two weeks ago against state-ranked Sidney was no fluke, the 5-foot-9, 190-pound Wells rushed for 176 yards and a pair of touchdowns on 33 carries, in the Buccaneers‘ road loss to Piqua. Justin Sloan, Running Back/Defensive Back, Bellbrook — The junior running back has improved his rushing yardage with each week, so far this season. Sloan recorded his second straight 100-yard game, and was just three yards shy of the 200-yard mark, and scored two TDs in last week’s home win over Eaton. He now has 523 yards this season. Send your team’s top game stats to: sports@xeniagazette.com.